The Bhutanese blue poppy has been declared a separate species different from its yellow-coloured cousins found in Sikkim and Nepal. The Bhutanese plants are named separately as Meconopsis bhutanica. This flower is a unique and rare one that grows at a high alitude on rocks and moraine dams, and produces a series of leaves over the years and then only flowers. This beautiful highland flower has four to five petals and is blue-purple in color. Botanists, Toshio Yoshida from Japan and Christopher Grey Wilson from Europe, examined the detail of the photographs of the Bhutanese plants and compared them with Nepalese plants of Meconopsis discigera and concluded that the two populations are distinguishable as different species. The report says that what is certain is that these high altitude species of Meconopsis are among the most beautiful alpines to be found anywhere in the world. This latest discovery published in June 2012 will further add to Bhutan’s reputation as a global bio-diversity host spot with a host of plant and animal life. 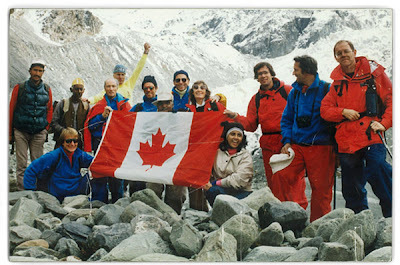 We here at the Bhutan Canada Foundation hope that all of our fellow Canadians are enjoying their Canada Day Monday! To celebrate Canada Day, we thought we’d tell you a little about Canada’s relationship and history with Bhutan. Enjoy! The relationship first began when Father William Joseph Mackey S.J., a Canadian Jesuit priest, was invited by the King of Bhutan, Jigme Dorji Wangchuck, to become an educator in Bhutan as part of the country’s ongoing modernization efforts. Father Mackey had joined the Jesuits in 1932, and was ordained in 1945. In 1946, he left Canada for the Jesuit mission in Darjeeling district of India. He served there for 17 years, during which time he participated in many education programs and was headmaster of two high schools. However, he also became unpopular with local authorities, and in 1963 he was ordered to leave the country. It was when the King learned of Mackey’s imminent expulsion from India that he invited him to become and educator in Bhutan. Mackey accepted the invitation, and as a preemptive measure, he had all his teeth removed, because he would have no access to modern dentistry in Bhutan. 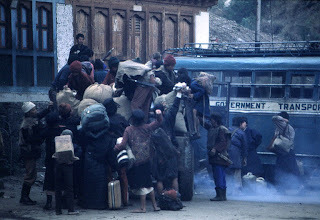 When Father Mackey arrived in Bhutan in October 1963, the Jesuits became the first Roman Catholic missionary order allowed in the officially-Buddhist nation. 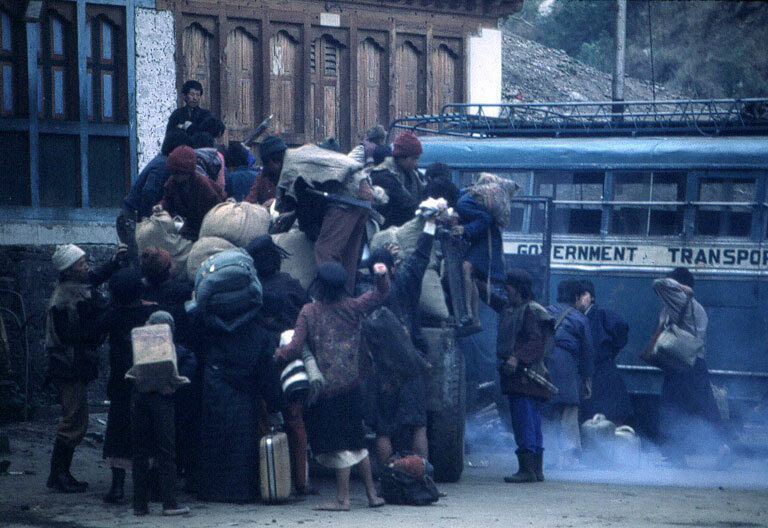 During the three decades that followed, Mackey performed no conversions of Bhutanese citizens, as that was forbidden under Bhutanese law. His first school, in Tashigang, was based in an abandoned cowshed and had 7 students. 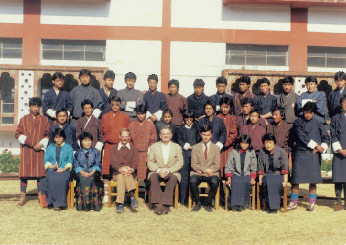 In 1973, Mackey was awarded the royal Druk Thuksey medal for his services to education in Bhutan. In 1985, he was granted honorary Bhutanese citizenship, and in 1988, when the Jesuit order left Bhutan, he was allowed to remain. After his death in 1995, his obituary on Bhutanese national radio lasted 15 minutes. In 1988, Sam Blyth had the privilege of visiting Bhutan with Pierre Elliot Trudeau and a small group of Canadians in celebration of the tenth anniversary of his company, Blyth Academy. During the visit, the Canadian group was received by the Foreign Minister and met the legendary Father Mackey, who has done so much for the Bhutanese people. As well, they presented a scholarship to Bhutan on behalf of Lester B. Pearson College. This scholarship provided full funding for Bhutanese students (one every two years) to attend high school on Vancouver Island. 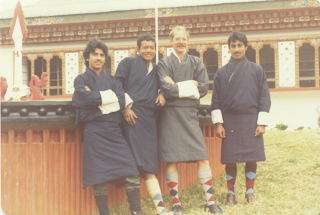 The first young Bhutanese student arrived in 1989 at the College, and spent his vacations with the Blyth family in Toronto. Ten other bright young Bhutanese students followed in his footsteps, almost all of whom have returned to Bhutan to make significant contributions to the country. Over the last twenty years, Sam has visited Bhutan on several occasions and has had the honour of being welcomed into the families of these Bhutanese students, which has deepened his love for the country. In 2008, Sam visited Bhutan with his wife and two of his children only to learn that the Canadian government was not renewing its CIDA support for the nation. Mindful of Canada’s special relationship with Bhutan, particularly its contribution to building its education system, the family decided that it was important to continue Canada’s presence in the country, so they stepped forward to help. On May 5, 2009, their dream was realized when the offices of the Bhutan Canada Foundation officially opened in Thimphu, Bhutan. Well there you have it! 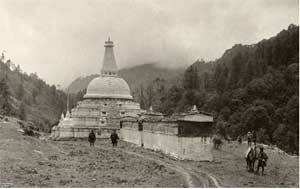 The history of the partnership between Bhutan and Canada. Happy (Bhutan) Canada Day everyone! Today we’re letting you in on something that is a key component of Bhutanese life – chillies! Chillies are incorporated into many dishes in Bhutan, and can be found at breakfast, lunch, and dinner as a vegetable, not as a means of spicing. 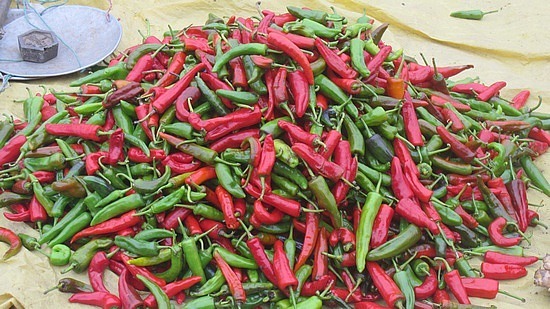 Some believe that Bhutan’s obsession with the vegetable traditionally stemmed from the need to keep warm, but even with modern heating chillies still remain a favourite! 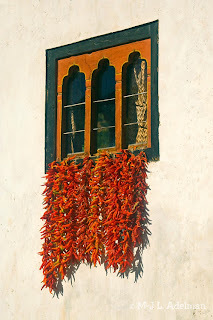 And of course when talking about chillies, you can’t forget Bhutan’s most popular dish, Ema datse, which is composed of chillies (large green, or sometimes red, but always very hot) accompanied by a cheese sauce, yum! Today we’re introducing a new blog series – Bhutan Fun Facts. Over the next four weeks, we’ll let you in on some interesting facts that you might not know about Bhutan! To start, we’ll be highlighting some of Bhutan’s weird and wonderful animals! Bhutan’s national animal, this strange looking creature has a mythical story. It is believed that in the 15th century, the “Divine Madman,” Saint Drukpa Kuenley, created the takin while at a congregation of his devotees. After being mocked about his supposed magical powers, the saint decided to show off his skills, and asked for a whole goat and cow to eat for lunch. After eating the entirety of both animals, leaving only the bones, he placed the head of the goat onto the body of the cow, snapped his fingers, and from the pile of bones rose a strange looking animal – the takin. Don’t believe the myth? Taxonomists today still have trouble categorizing the animal – in fact they’re so stumped they’ve had to give it a class of its own, Bu-dorcas taxicolor. Pretty neat, huh? Another mythical creature, the migoli (or yeti) is described as a human-like creature that walks upright, with long, dark hair all over its body except for its face. Commonly agreed to exist, the migoli is most often spotted by Himalayan climbers and can also be identified by its giant footprints in the snow. Although many believe in the creature, some scientists have suggested that it could actually be a strange species of primate, or even a descendant of the Neanderthals. 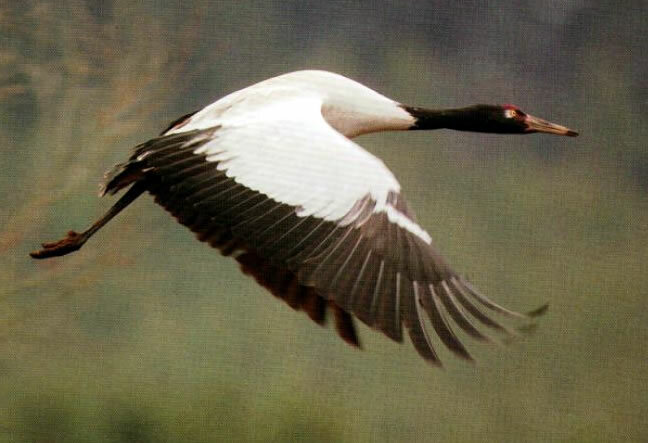 The rare and endangered black-necked crane occupies a special place in Bhutanese hearts and folklore. Its arrival every autumn from Tibet inspires songs and dances; it usually heralds the end of the harvesting season and also the time when families start migrating to warmer climates. Like other cranes, these have an elaborate mating ritual, a dance in which pairs bow, leap into the air and toss vegetation about while uttering loud bugling calls. It can be difficult to distinguish the sexes because the colouration is so similar, but the females are slightly smaller. Their migration is on of the most difficult in the world. To reach their winter grounds in Bhutan the birds must traverse the highest Himalayan peaks. In the tropical forests of southern Bhutan you’ll find the beautiful hornbill. These black and white birds with brightly coloured beaks are know to be very picky when it comes to food. They usually choose their food right at the perfect moment of ripeness – late enough to avoid bitterness, and soon enough to ensure someone else doesn’t steal it. Their survival with such picky attitudes is an indication of the health of the forests in Bhutan. Amazingly, male hornbills have been known to swallow as many as 70 small fruits which they then carry back to their young. Applications to teach in Bhutan in 2013 are open! 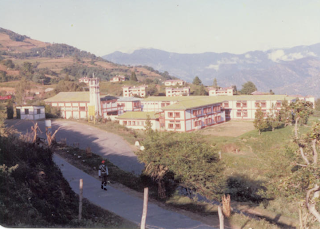 The “great place” of the title was Sherubtse College in 1985, where I was posted to teach. At that time, 3 other Canadians were also there: one, Fr. Gerald Leclaire, was the Principal; another, Fr. John Legge, taught Physics; and the third, Jack McManus, taught English. (All were part of the Jesuit contingent in that part of South Asia.) My subject was S.M.G., or Structures of Modern Government. The Jesuits had their own mess, up on the hill close to the “upper bazaar”. I ate in the staff mess, which was also populated with the other non-married teachers at Sherubtse. They were all, initially anyway, lecturers from the University of Delhi. The married ones had their own private quarters. Students dined in their own mess, which also served as the venue for the Saturday-evening disco. I was asked to chaperone this event, which gave me an opportunity to get to know my students outside of the classroom setting. Peter and his students at Sherubtse College. But the grounds of the College were not only used for sporting and religious functions. Each week there was a period of S.U.P.W., Socially Useful Productive Work. For this, the students were required to maintain the College gardens, which provided fresh vegetables for the students’ mess. Some of the Canadians, myself included, supervised these activities. At other times, Fr. Leclaire would supervise P.W.D. (Public Works Department) activities, which were minor repairs to the roads and landscape of the College. Other buildings included the administrative offices, classrooms, the College library (teachers were allowed to peruse the stacks, students were not), and a small dispensary for minor ailments. (More serious health problems were treated at the Dantak hospital close-by, “Dantak” being the Indian force used to build the roads in eastern Bhutan). The administrative section housed the one phone in the place, which could be used for calls from Tashigang to Samdrup Jhonkar, but no further. Computers were nowhere to be seen. There were 4 hostels (or dorms) for students — 3 for boys and only 1 for girls (which gives one an idea of the ratio between the 2 sexes at that time). Each hostel had a live-in warden, or “den mother”. I was Warden of the Lower Hostel, and lived in a 3 room set-up on the ground floor (a bathroom with a fancy hole in the floor for a toilet, a living room, and a bedroom). It was my responsibility to keep an eye on the students, and ensure that quiet times were observed in the evening for those who wished to study. This was not a problem in my hostel, as I had mostly science students who tended to be serious about their studies. Some were so serious, in fact, that they stayed in the hostel over the winter months to study for exams the following spring. Life was cold, desolate, and lonely, during those few months. But they reasoned that if they returned to their villages (they were inevitably the poorer kids), they would not be able to study as much as they wished to do. The hostels were cold even when classes were still on. Being built only of concrete, with no heating at all, they held the cold for long periods of time. Hence it was common for me to go outside to get warm. Peter and some of his students. The students, especially the ones in my hostel, were a real joy for me. Yes, the great beauty of the place was certainly enchanting. (I would wake up each morning to look out on the snow-capped peaks of the Bhutan-Tibetan border.) And yes, I loved teaching a subject that I had spent 5+ years in university studying. (I was, and still am, quite enthusiastic about any subject that I find of interest.) But it was “my” students (aged from the late-teens to the mid-twenties), and the relationships that I developed with them, that made my time at Sherubtse so wonderful. Some are frequently in my thoughts to this day. Like the title says, it was a great place to be. Great information on Bhutan from the World Bank. Have a read! In this series of articles published by Bhutan’s English language newspaper, Kuensel, author Tshering Tashi explains the foundations of modern Bhutanese society, as outlined in a letter from King Ugyen Wangchuk, dated 1921. 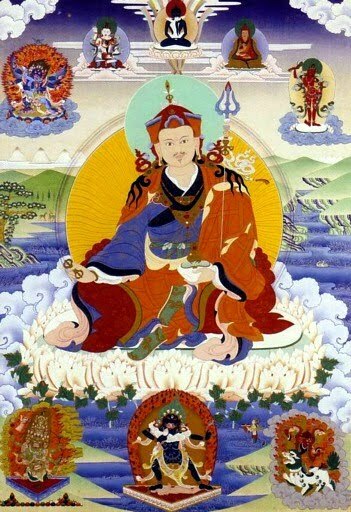 Today Bhutan celebrates the birth of Guru Rimpoche, also known as Guru Padmasambhava, an Indian sage who travelled to Bhutan in the 8th century to establish Tantric Buddhism. He is regarded as the 2nd incarnation of Buddha. According to legend, Guru Rimpoche flew to the Taktsang Senge Samdup cave on the back of Yeshe Tsogyal, a semi-mythical female deity or figure of enlightenment in Tibetan Buddhism, whom he transformed into a flying tigress for the journey. Once at the cave Guru Rimpoche is said to have meditated in a spot around which the famous Tiger’s Nest monastery was built. At the Kurje Lhakhang temple in Bumthang district an imprint of Guru Rimpoche’s body can be found in the wall of a cave.